LAS VEGAS - May 3, 2018 - PRLog -- Veterans Village is pleased to announce that they have been selected as the recipient of a Feeding America Food Share grant. 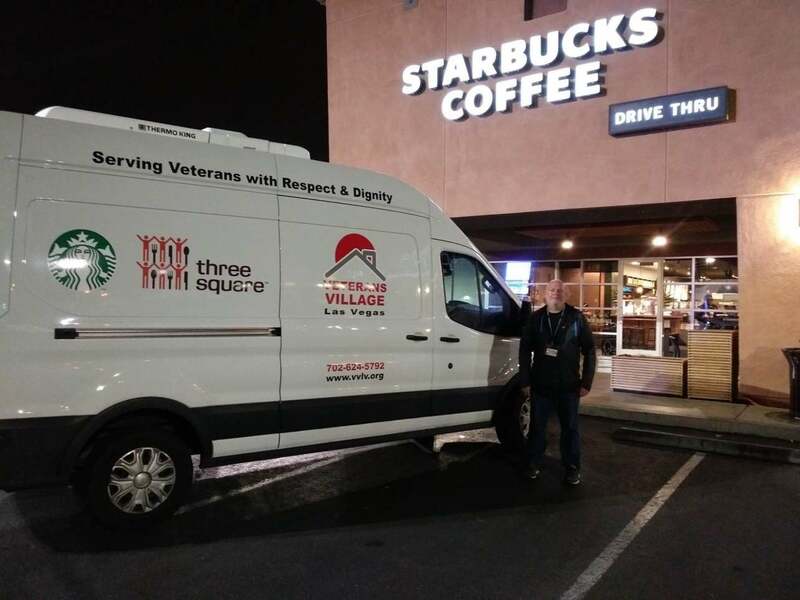 The innovative food rescue program will allow Veterans Village Las Vegas to collect food each night from 37 Starbucks locations in Las Vegas. Rescued food items will be distributed to all three of the Veterans Village locations in Downtown Las Vegas and help feed up to 500 people daily. "This is a huge boost to our ability to serve first class food to our residents", Dr. Arnold Stalk, PhD, Founder of Veterans Village. Food rescue is a critical vehicle to combat hunger. Each year, 72 billion pounds of food are wasted in the United States, while 41 million people face hunger, including 13 million children. The process of getting food to Americans in need requires a dynamic infrastructure and sophisticated management. Feeding America cultivates partnerships to secure donations from national food and grocery manufacturers, retailers, foodservice locations, shippers, packers and growers and from government agencies, and other organizations. Feeding America® is the largest hunger-relief organization in the United States. Through a network of 200 food banks and 60,000 food pantries and meal programs, we provide meals to more than 46 million people each year. Feeding America also supports programs that prevent food waste and improve food security among the people we serve; educates the public about the problem of hunger; and advocates for legislation that protects people from going hungry. Individuals, charities, businesses and government all have a role in ending hunger. Donate. Volunteer. Advocate. Educate. Together we can solve hunger. Visit www.feedingamerica.org (http://www.feedingamerica.org/?s_src=W184DIRCT&s_subsrc=http%3A%2F%2Fwww.feedingamerica.org%2Fabout-us%2Fpress-room%2F2018HungersHope.html), find us on Facebook (http://www.facebook.com/FeedingAmerica) or follow us on Twitter (http://www.twitter.com/FeedingAmerica).